Throughout history as societies have gone through tough or depressing times a champion has emerged to slay the dragons, vanquish the invaders, and generally make people feel happy and better about themselves, no matter how wretched and miserable their lives really are. Stories of local champions and heroes emerging from the masses are told over and again in religious texts, history books, and is at the core of The Hunger Games trilogy. As Thailand rapidly heads towards a fourth year under the rule of a military junta government with any hope for elections next year all but dashed, not to mention coming out of a 12 moth mourning period for the late Bhumibol Adulyadej and a much anticipated coronation appearing to be not going to take this month, a ‘people’s champion’ has emerged almost on cue; deflecting attention away from the ‘watchgate’ scandal surrounding deputy prime minister General Prawit Wongsuwan, and Thailand’s rapidly shrinking space for opposition to the ongoing military rule and suppression of political activities. 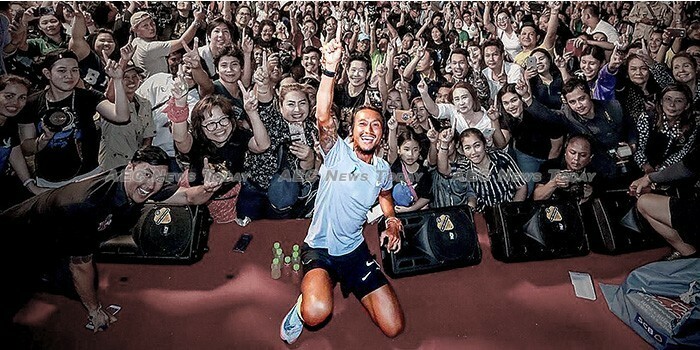 For the last 55 days while the rest of the world has gone about its daily business a 38-year-old singer from a popular Thai rock band, Bodyslam, has been running his way from Thailand’s southern most tip abutting Malaysia, to its northern most point on the border with Myanmar. The distance? A staggering 2,215.40 kilometres (about 1,376.59 miles). The reason? To raise money for 11 state-run provincial hospitals, and to “help Thai people value the act of giving more… to encourage Thais to help Thais”, and to raise awareness to better levels of fitness generally. 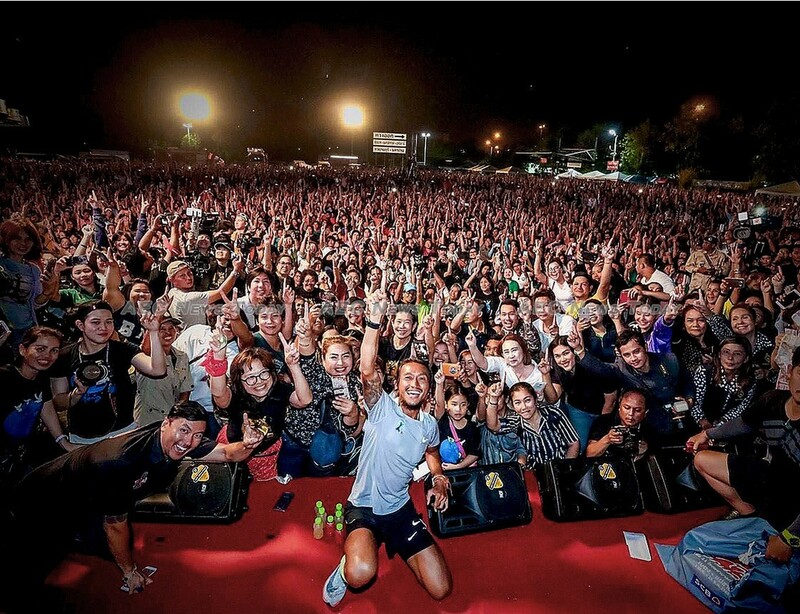 Reasoning that if every Thai in the country donated just Bt10 (about US$0.31) his Kao Kon La Kao Charity Run should be able to raise some Bt700,000 ($21.387 million), Athiwara Khongmala, better known locally as ‘Toon Bodyslam’, set off to reunify Thais through a common theme of mutual caring and sharing. Almost from his first steps Mr Athiwara found his path lined with well-wishers and people wanting to be photographed parting with their hard-earned money to help those less fortunate than themself, even though many of those giving were from the lower socio-economic brackets themselves. As local media increased its coverage of his run so to did the number of people on the roadside grow with every step. The old, the frail, the young. Men, women, business-owners, and labourers alike all downed tools to cheer their champion on… and contribute to his quest. 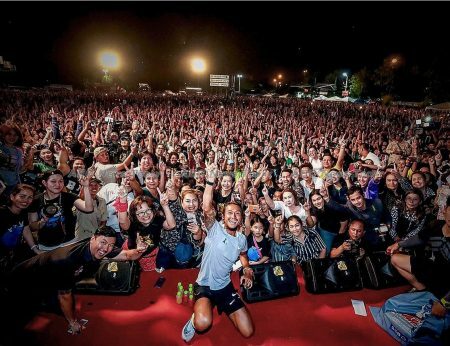 When he finally completed his run at 6.20pm last night, December 25, the tally stood at more than Bt1.1 billion ($33.6 million), which was topped up by an additional Bt10 million ($305,530) donation from Thai businessman Somsak Amornrattanachaikul. And donations continue to pour in via his website, even though Mr Athiwara has completed his goal. At the time of writing donations exceeded Bt1.213 billion ($37.060 million) and were still rapidly increasing. In becoming the first person to run from Thailand’s south to its north Mr Athiwara crossed through 20 provinces, along the way becoming the poster boy for ‘Thainess’, a vague term used to describe all of the nice, traditional, passive, and polite aspects of Thai culture that Thais like to believe make them unique. While already a heartthrob to his legion of fans as a rock singer, Mr Athiwara has become the very ‘champion’ that the junta could only have dreamed of. Non-political (so far), popular, of the right age demographic to cross generations, espousing a similar philosophy as its 12 core values of citizenship, and willing to make great sacrifices to help fellow Thais, Mr Athiwara is the epitome of what the junta believes a good citizen should be. If an election was held tomorrow for an independent prime minister Mr Athiwara would be swept into office. If any doubts remain, a recent Bangkok Poll found Mr Athiwara to be the most admirable person of the year, attracting 83.5 per cent of the vote, ‘bodyslamming’ junta leader and Prime Minister General Prayut Chan-o-cha, who scored just 11.1 per cent. A sobering thought for a junta leader who is facing increasing pressure domestically to progress further down the path of democracy and allow political activities to resume, while coyly refusing to reveal his own future political ambitions. Mr Athiwara could not have completed his run alone. In the video above a vast army of volunteers are seen assisting him along the way, highlighting the very aspects of Asean Community (AC) that we at AEC News Today like to acknowledge with the title The Best of the AEC. The 11 hospitals that will benefit from Mr Athiwara’s marathon run are: Yala Hospital, Surat Thani Hospital, Ratchaburi Hospital, Chao Phraya Yommarat Hospital, Saraburi Hospital, Chiangrai Prachanukroh Hospital, Nan Hospital, Phramongkutklao Hospital, Chao Phya Abhaibhubejhr Hospital, Khon Kaen Hospital, and Nakornping Hospital.